Sick sinus syndrome — also known as sinus node disease or sinus node dysfunction — is a group of heart rhythm problems (arrhythmias) in which the heart's natural pacemaker (sinus node) doesn't work properly. The heart rhythms of a person with sick sinus syndrome can be too fast, too slow, punctuated by long pauses — or an alternating combination of these rhythm problems. The syndrome is relatively uncommon, but the risk of developing it increases with age. Your heart is made up of four chambers — two upper (atria) and two lower (ventricles). The rhythm of your heart is normally controlled by the sinus node, an area of specialized cells in the right atrium. This natural pacemaker produces the electrical impulses that trigger each heartbeat. From the sinus node, electrical impulses travel across the atria to the ventricles, causing them to contract and pump blood to your lungs and body. If you have sick sinus syndrome, your sinus node isn't functioning properly, causing your heart rate to be too slow (bradycardia), too fast (tachycardia) or irregular. Sinus arrest. The sinus node activity pauses, causing skipped beats. Diseases and conditions that cause scarring or damage to your heart's electrical system can be the reason. Scar tissue from a previous heart surgery also can be the cause, particularly in children. Rarely, the cause can be genetic. Sick sinus syndrome can be unmasked by medications, such as calcium channel blockers or beta blockers used to treat high blood pressure, or by other conditions causing the heartbeat to be slower or faster than normal. In most cases, the sinus node doesn't work properly because of age-related wear and tear to the heart muscle. Electrocardiogram (ECG). 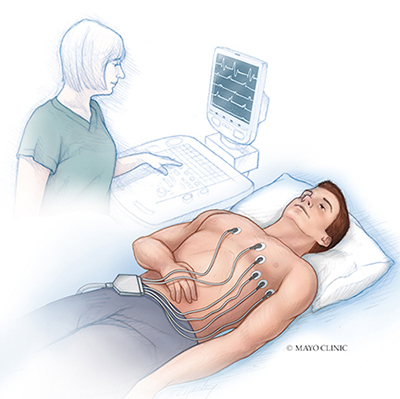 During this test, sensors (electrodes) are attached to your chest and limbs to create a record of the electrical signals traveling through your heart. The test might show patterns that indicate sick sinus syndrome, including fast heart rate, slow heart rate or a long pause in the heartbeat (asystole) after a fast heart rate. 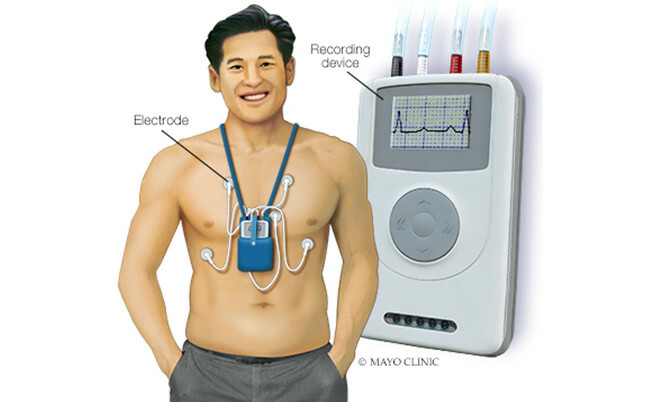 Holter monitor. This portable device is carried in your pocket or in a pouch on a belt or shoulder strap. It automatically records your heart's activity for 24 to 72 hours, which provides your health care provider with an extended look at your heart rhythms. Event recorder. This portable electrocardiogram device can also be carried in your pocket or worn on a belt or shoulder strap for home monitoring of your heart's activity. You might be asked to use this device to use for up to a month.When you feel symptoms, you push a button, and a brief ECG recording is saved. This allows your health care provider to see your heart rhythm at the time of your symptoms, which can help pinpoint sick sinus syndrome. Implantable loop recorder. This small device is implanted just under the skin of your chest and is used for continuous, long-term monitoring of your heart's electrical activity. 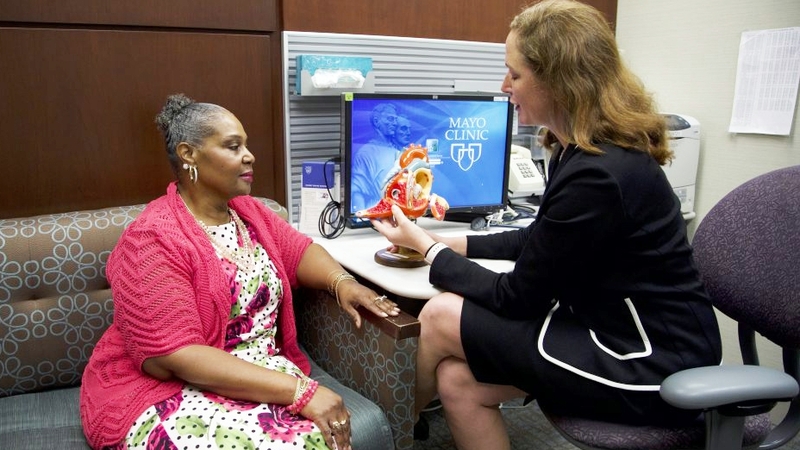 An implantable loop recorder may be worn from months to years.This device is automatically triggered by an irregular heart rhythm (arrhythmia) or you can trigger it when you feel symptoms. Your health care provider will likely check your current medications to see if any could be interfering with the function of your sinus node. Medications used to treat high blood pressure or heart disease — such as beta blockers or calcium channel blockers — can worsen abnormal heart rhythms. In some cases, adjusting these medications can relieve symptoms. The type of pacemaker you need depends on the type of irregular heart rhythm you have. Some rhythms can be treated with a single chamber pacemaker, which uses only one wire (lead) to pace one chamber of the heart — in this case, the atrium. 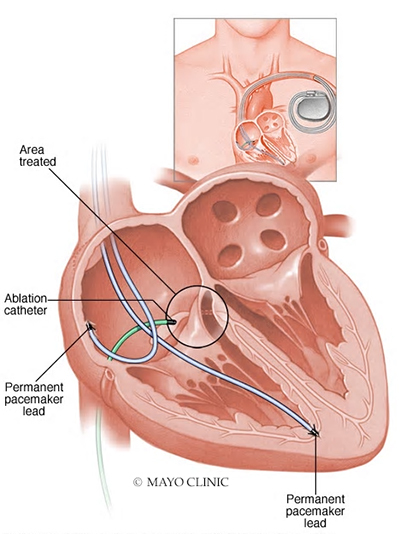 However, most people with sick sinus syndrome benefit from dual chamber pacemakers, in which one lead paces the atrium and one lead paces the ventricle. If you have a pacemaker and your heart rate is still too fast, your doctor may prescribe anti-arrhythmia medications to prevent fast rhythms. If you have atrial fibrillation or other abnormal heart rhythms that increase your risk of stroke, you may need a blood-thinning medicine, such as warfarin (Coumadin, Jantoven) or dabigatran (Pradaxa). This procedure can also control fast heart rhythms in people with pacemakers. 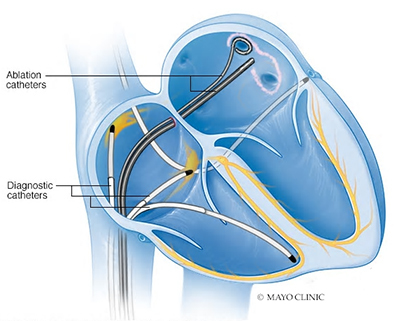 It involves applying radiofrequency energy through a long, thin tube (catheter) to destroy (ablate) the tissue around the atrioventricular (AV) node between the atria and the ventricles. This stops fast heart rhythms from reaching the ventricles and causing problems. Radiofrequency ablation of atrial fibrillation. This procedure is similar to AV node ablation. However, in this case, ablation targets the tissue that triggers atrial fibrillation. This actually eliminates atrial fibrillation itself, rather than just preventing it from reaching the ventricles.